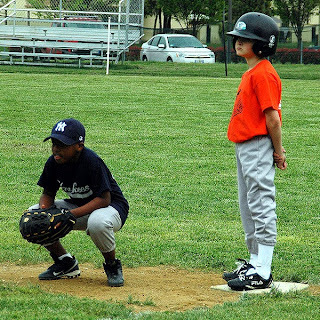 Here's a guest post from a friend who is both an ex-athlete and father of a young boy participating in organized youth sports. It's an entertaining read with some interesting thoughts on the value of organized sports versus self-directed play. Since it's a long article, I decided to break it into two parts, the second of which I'll post next week. I’m a lucky man. No really. As I start to experience things through a father’s eyes I realize how lucky I was and am. Athletics has largely defined who I am for most of my life. Certainly my youth. I was fortunate enough to have been offered athletic scholarships to several Division I schools to play football as well as eventually signing with a small Division I school to play basketball (my love) to play collegiately. I also have done a little coaching at both the college level as well as high school. I can’t tell you how much of a joke college guys think of AAU ball (I mean who needs travel basketball at age 11?). But I digress. When I was little I was always pretty good but I don’t think I was ever the best player in my league. In fact, since I went to a large inner city public high school I was never even the best player on my high school team (rare for a D-1 player). I do know that I was known as a kid with a large capacity to work and that I always got better every year. This is not to say I was without talent. I could play. One of the byproducts of playing at that level is that you get to know real quick how many truly great players there are and where you fit into the pecking order. Sometime in early spring 1983 my father took me to the Omni in Atlanta to see the McDonald’s All America Basketball Game. The player of the year was Reggie Williams (who played on one of the great teams of all time at Dunbar Baltimore) as well as future greats Kenny Smith, Dallas Comegys, and Tommy Amaker, but the guy who changed my life was Pearl Washington. I won’t bore you with it but the day I saw this guy from Brooklyn play it literally changed the way I lived and breathed for many many years. He was a New York City guard in every sense of the word. I was 12 and literally walked out of there with my Dad and knew what I wanted to be. I don’t think that has ever happened to me since. It’s funny - my Father was a tough as nails southerner who had played pro baseball and worked as a scout for the Reds and I can’t remember him ever encouraging me to play ball. Never. He grew up in a cotton mill town of the depression era south and even though athletics got him out of the mill he was never a guy who hounded me about sports. Helpful – yes. Pushy – never. Anyway, after seeing Pearl play I lived at the park. You see, the best thing about basketball was that you didn’t need to be on a team to play. You could simply go down to the park at Piedmont, Ralph McGill, Grant, etc… and get a game. Day, night, really late night - didn’t matter. I could go somewhere and get a game. My time was actually spent playing the sport that I loved. And FYI, this still goes on in every community in America. I currently live in perhaps the most white bread place on earth and I can still go to the local YMCA and play ball. All day if I want. Let me repeat. I was able to succeed because I played. My time was spent dribbling, shooting, passing, competing (and if you don’t think that matters – try losing a game in the August Atlanta sun with 30 guys waiting to play. I promise – one plays to win). I know that was a long prologue but I wanted to set a stage. You see I have a 9 year old son who plays baseball. – America’s pastime. Apple pie, Chevy, and the rest of that BS. He’s pretty good too. He has enough ability to probably be a decent high school player. I’m not sure that he’s as gifted athletically as I but I think he’s good enough to have a good experience playing team sports. I think that youth baseball travel ball only gives the illusion of playing baseball. Here’s how it really works: Johnny and his folks leave the house at noon on a Sunday to drive 30 minutes (if your lucky) to a field by 12:30 for a 1:30 game. The game takes 1 ½ hours and Johnny gets 4 at bats, 2 chances in the field, and pitches 2 innings. 20 minutes is spent gathering stuff/post game meeting with a 30 minute drive home to eat dinner. Meanwhile some kid in Santo Domingo did that before he ate breakfast. And he did it with some socks in his back yard. Think about it. You just spent 4 hours for Johnny to get 4 at bats, catch 2 balls, and throw 35 pitches! All the while some idiot who most likely never played a meaningful inning in his life acts like Leo Durocher or Bobby Cox. There is no way you can convince me that this is good youth development. No way. Check back next week with Inside Youth Sports to read the conclusion of this article. Find out what this parent believes is a better approach to more fully develop a young athlete's potential!